I had a big Easter BBQ planned for Monday. Four Good Friday Flathead was a good start but I would need a bit more fish to make sure my guests didn’t go hungry. That was my excuse for getting out on Easter Sunday! I arrived at the Bribie Island Bridge at 5.00am and parked on the bank, on the mainland side. I put on my waders and had a few casts around the rocks under the bridge. I caught a small Moses Perch and released it. Just as it started to get light I moved off to the south. There was lots of surface feeding going on and the tide was running out strongly. Low tide was at around 8.00am. I waded past the oyster jetty with no more bites and then started to fish the drain that runs round from Sandstone Point. I fished all along it without a touch. I moved out to a point where the water was waist deep and started to move north, back towards the bridge. I was fishing with a new favourite, the GULP 3” Smelt Crazylegs Grub soft plastic. It is a short version of the Crazylegs Jerkshad that has proved so useful. I had it rigged on a 1/6thoz 1/0 jighead. I was using my light spin rod and a 12lb fluorocarbon leader. I got a couple of solid bites but could not keep the fish on. Then as I moved towards the oyster jetty a fish grabbed the plastic about a metre away from me. I struck with rod and stepped back. It was a good fish but it did not do much, initially. I decided to walk it back to the shore. I loosened the drag a little, as I did not want a bust off. I started to tow it towards the bank and about half way there it really woke up and made a few powerful runs. As I dragged it up onto the muddy shore the leader snapped, but it was clear of the water. 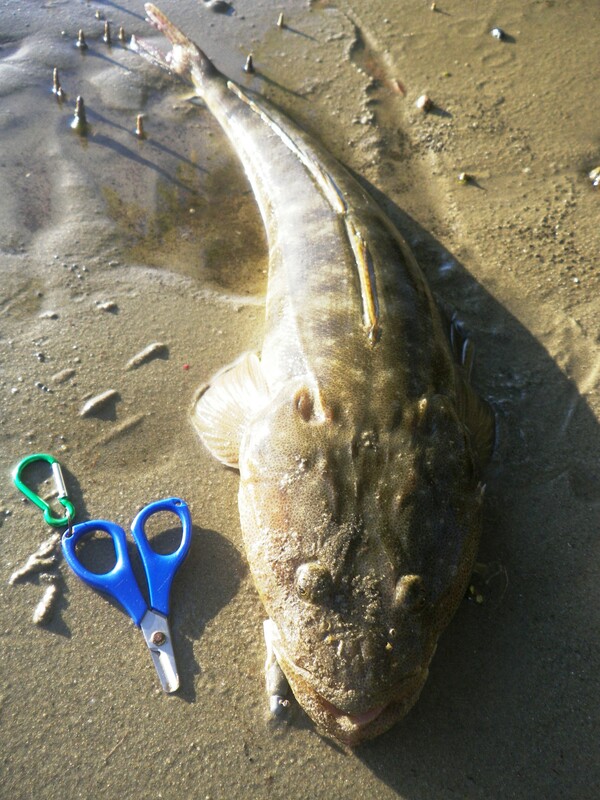 It was a healthy female Flathead, just under 70cm long. I fished around this area for another hour and caught and released several Flathead that were around the legal size limit of 40cm. At about 8.30 I gave up. It had been great morning land-based fishing in the Pumicestone Passage. This entry was posted in Bribie Island, Fishing Reports and tagged 70cm Flathead, Australia, Bribie, Bribie Island, estuary fishing, fishing in Queensland, fishing soft plastics, fishing with, fishing with soft plastics for Flathead, Flathead, Flathead on soft plastics, land based, land based fishing, land-based fishing at Bribie Island, low tide, lure fishing, lures, soft, soft plastic techniques, waders. Bookmark the permalink.